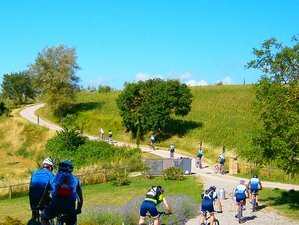 Get on a bicycle and explore Umbria and Tuscany. Add optional activities during your free time. Have fun in a hands-on cooking class, learn about Umbrian wine and olive oil with tasting. Agriturismo Podere le Olle is an old farmstead in the beautiful Umbrian hills that sweep towards Tuscany. It consists of two sympathetically restored stone buildings, both welcoming and comfortable. You will stay in bright and spacious rooms, each with independent access and its own private bathroom. Accommodation takes place in a restored stone house hosting a total of 9 rooms sharing a rather big garden, so even in full season there is plenty of room for all our guests. Five rooms are based on the ground floor and have an independent entrance through the garden, four are on the first floor offering a lovely view over the countryside. Connected to the dining room, the spacious and well-equipped kitchen has a large open hearth and provides the venue for classes in traditional Umbrian cuisine. In the room next door, our own olive oil and a selection of local products are for sale. An old oven, now once again fully functional, is next to the farmhouse. Furthermore, at the back of the house, there are two old stone baths, once used for handwashing linen. A track winds through the fields of the property, ideal for a brisk morning walk. There is a wonderful pool with 180 views across the valley, making this the perfect setting for a relaxing holiday in the Umbrian countryside. All rooms are spacious and bright, they are tastefully furnished with a great attention to details. Bed-linen and bath towels are chosen in natural cotton. Beach towels can be provided with a small supplement. Each room is provided with private en-suite bathroom. Bathrooms all have a shower, and a hairdryer. Basic toiletries are provided, for further needs don't hesitate to ask. We have no air conditioning, normally the night breeze and a fan are enough to enable good sleep. Wifi is offered free of charge at the reception or in the dining room, signal is also strong in the garden. There is no wifi connection in the rooms, and no tv. Amenities include daily maid service, organic homemade breakfast, use of open air swimming-pool, wifi in common areas and in the garden, parking, use of our large professional kitchen, guests have all day access to a self service bar and to tea and coffee facilities. Podere le Olle cooking classes are designed to help the student first form ideas about one or more menus and then actually create the meals that were envisaged, putting ideas into practice in a convivial and pleasant atmosphere. Combining the chosen ingredients and foods with the appropriate wines is an essential part of our courses. In time, you will become confident in your knowledge of basic culinary principles, which will enable you to chose ingredients and spread your culinary wings when it comes to creating your recipes. The cuisine is based on simplicity and on what is essential, all the elements that are indispensable for the creation of the simplest of dishes as well as the most refined menus. All of this is enhanced by the good quality of the used ingredients. Pick up your bike and start exploring around. Podere le Olle will design a lovely itinerary for you, and you won't forget it. Podere le Olle loves cyclists all year round and will do their best to make them feel welcome. Umbria is ideal to explore on a bike and depending which bike you choose they'll design the perfect itinerary. You can also pick up a flat road leading you from Chiusi to Arezzo and get the train back. This is called Sentiero della Bonifica. Beautiful, indeed. The Farm Holidays "Podere le Olle" is situated halfway between Florence and Rome and within easy reach of the motorway. It is ideally placed for outings to Orvieto and Citt della Pieve, Lake Trasimene and Perugia as well as the gorgeous Val d'Orcia, which not only provides the ideal starting point for excursions to Tuscany, but is also home to food-and-wine-lovers tours. A gravel road leading through olive groves takes you up to a car park on the edge of the Agriturismos garden. Montegabbione is picturesquely situated on a hill at 594 meters above sea level, along the Etruscan-roman wine route; according to finds this is probably the period of its origin, but the town itself with its solid Medieval wall was built in XI century. The system of settling which developed is still visible in the surrounding castles of Montegiove and Casteldeifiori and is due to the strategic position of the town right halfway between Rome and Siena, Orvieto and Perugia, Bolsena and Trasimeno Lake. Different important local families tried to establish their dominion over the area that became around 1300 a stronghold of the Monaldeschi family of Orvieto, and at the end of the century it came under the influence of Perugia. A long period of stability began with the annexation of the territory to the Church. Outside the walls are the church of the Madonna delle Grazie, the ruins of the Acqualta abbey and the Franciscan convent of La Scarzuola of which the modern and metaphysical project of the architect Tommaso Buzzi is an original development. Leaving behind the beautiful hills around Montegabbione one can shortly reach some of the most interesting and fascinating places of the region. Orvieto is 30 Km away on a very panoramic road extending though cultivated vineyards and olive groves, close to it is the medieval jewel of Todi approached passing by the Corbara Lake. Citt della Pieve, known as the town where the famous painter Pietro Vannucci (Il Perugino) was born, is only a fifteen minutes drive away, from there one has easy access to the classical sites of Umbria: Perugia, Assisi, Spello, Foligno, Gubbio, Bevagna, Montefalco, Trevi, Norcia, Cascia and Spoleto. Our house location also invites visitors to explore the nearby Tuscany: the world famous towns of Florence and Siena are little more than a hour away, even closer are the historical wine-cellars of Montepulciano and Montalcino, and the enchanting Renaissance town of Pienza; the Etruscan Chiusi and San Casciano dei Bagni with its hot springs are just fifteen Km away, and so are Certona and Sarteano, delicious little towns off the beaten tracks not to be missed. Beautiful Lake Bolsena and Civita di Bagnoregio also represents the ideal destination for a daily outing of great interest. The deal includes daily breakfast. Breakfast is served from 08:30 to 10:00 in the garden overlooking the swimming-pool or in the colder season the beautiful dining room in the main house is used. Early or late breakfast may be served with a small extra charge. From 2014 we also offer gluten-free breakfasts if booked in advance. The breakfast features either homemade and local organic products. Whatever can't be found locally is bought supporting fair trade market. We offer fresh seasonal fruit, natural yoghurt, fresh bread, a variety of homemade jams and organic honey, homemade cakes and biscuits, local cheese and salami, and free range eggs cooked to order. City tour: La Scarzuola, also known as the City of Buzziana is only 10km away (visiting times are limited and visits have to be pre-booked and are suitable for small groups only). If you are interested we will find out dates and times of tours. Cooking classes: Preparation of a full menu, including fresh pasta, which will be enjoyed afterwards in an informal and convivial atmosphere. Partners not attending the class can join for lunch (EUR 20 per person). Drinks are always included, different wines will be tried in combination with dishes. Cycling: Anyone who likes cycling and doesnt mind the odd climb will love exploring the beauty of the surrounding countryside and the quiet little roads and paths. We would be delighted to advise on a variety of routes off the beaten track, check out our cycling holiday special. Fitness, spa, and golf: The nearby Terme di Chianciano and San Casciano ai Bagni welcome lovers of spas, fitness centres and beauty farms. The nearest golf club is about 40km from the Agriturismo, at Panicale near Perugia. It is the Lamborghini Golf Club. Horse riding: The stables "Centro Equestre Wild Horse" at Monteleone d'Orvieto can arrange for outings on horseback, also for the less experienced rider. This is also a very special way of exploring our region. Walking and trekking: The woods on the edge of our property are ideal for walking and our dog would be delighted to be your guide. If you like to explore, the Cooperativa Terra di Montegiove arranges for walks and rambling tours of different levels of difficulty. Wine and olive oil tour: We can organise wine tours followed by wine tastings in some nearby cellars. Some offer special treats to our customers. We will be happy to show you how to taste and appreciate an Extra virgin olive oil. 6 km from the Fabro toll station on the Autostrada Del Sole (A1), about halfway between Florence and Rome. At the toll station follow signs to Montegabbione on the left until you reach the sign "Faiolo". Just past this there is a tall cypress tree and an arrow pointing right, where you turn right. The Agriturismo is at the end of the gravel road (about 500 m). Check Ryanair flights to Perugia, as they often have good deals. Podere le Olle is an organic farmhouse in Umbria, Italy, with bed and breakfast accommodation offering cooking classes, olive oil tasting, and cooking holidays.